Yesterday was the official end of the 2012-2013 school year and the end of 5 years as a student at MSU. 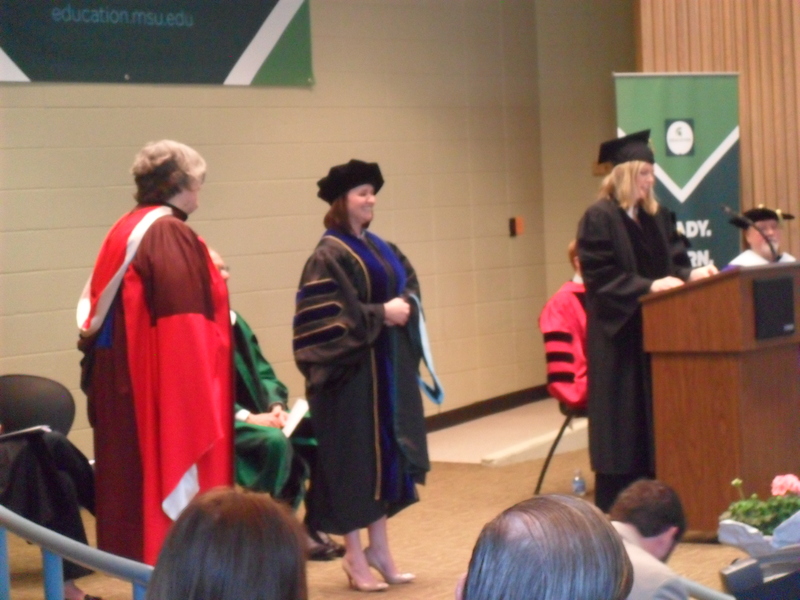 I was officially given my “hood” and my PhD degree yesterday as well. It was an early day as I picked my Dad up around 7 am and I went with him and Mike to Erickson Hall for the ceremony. A bunch of us were herded into the Kiva (which seemed quite small with everyone in there) about 9:30. The Kiva is just a large lecture hall, which made it interesting to squeeze into a little desk with my giant gown on. There ceremony was a bit different than other graduations. There were 13 different PhDs being given out in the College of Ed to nearly 60 people. Each person’s advisor came up to say a little about each person: what their research was about, where they’re heading next, etc. It was fun to hear about everyone’s dissertations. I was unaware of even what some people in my own program have been studying. Believe it or not, we often talk to each other about our work in general terms unless we’re specifically asked about it. “I’m collecting data now” or “I’m finishing soon…” etc. It was cool to hear about what everyone else has spent working on for this entire year. When I got up there, Anne-Lise said some nice things about me and my work and a little about my journey. To hear someone else explain it sounds nearly impossible that I even did this. I tried to soak it all in and enjoy the moment they put that hood on my shoulders. Afterwards, we visited with people upstairs on the 3rd floor. It was nice to have Anne-Lise meet Mike and my dad. It was definitely like worlds colliding there. I showed them the board on the 3rd floor where all of the doctoral students’ pictures are and saw my picture that was taken in 2008 on my first day of orientation. My goodness a lot has happened to me since then. I took Mike & Dad to Crunchy’s afterward to celebrate. It only made sense since that’s my go-to place to unwind after some days at MSU. I will miss those burgers being just down the street. When I took my dad home, I stuck around a bit to celebrate with my mom, sister, nephew, aunts, and uncles. By the end of the night I was incredibly exhausted. The big debate is whether or not you can call me Dr. Whitlock now, or if I need to wait until my defense is over on Tuesday. The only problem with graduating yesterday is that I know I still have this major milestone ahead of me (and not to mention, a lot of grading to finish as well). I suppose you can call me Dr. Whitlock but I won’t really feel like it until Tuesday afternoon. Both this school year and last, I taught Section 6 of TE 401 and TE 402 at MSU. These are the social studies and literacy methods courses for the MSU seniors. The courses are not a year-long sequence with instructors usually. The students are together all year, but the instructors don’t usually stay with the students the whole year. I’m one of the few people who teach both social studies and literacy, so I do get to meet these students on the 1st day of the fall semester and see them through until their graduation. Both years I have been assigned Section 6, which seems to be my lucky number. Both years, I’ve had the pleasure of teaching some amazing people in Section 6. They’re fun, inspiring, smart, and dedicated students. At this stage in their careers, so early on, they are excited about joining the field of education. Let me tell you that it is so rare these days to have people excited about teaching anymore. I want to bottle their energy, enthusiasm, and excitement and feed it to a lot of people I know. It would be some magic elixir that teachers could drink when they feel frustrated or burned out. I would make a killing if I sold it. I started my blog with a picture of the students of Section 6 from 2011-2012. They lit the spark for my dissertation and reaffirmed that teaching and research is what I wanted to do for my career. They inspired me to start the Year of Writing. This year’s Section 6 helped me in a different way. If last year’s Section 6 was the spark, this year’s group was the fuel. They kept me going when I was collecting data–it was great to be able to commiserate with them about teaching elementary school and share stories. When I spent day after day in my house writing, seeing them on Tuesdays was a wonderful break. When I finished writing, I could not wait to tell them. Today was our final exam. Much like the 2012 Section 6, the 2013 group handed out awards. I won “Best Dressed” mostly because I’m usually the only one not wearing my pajamas in class, and “Best Laugh.” This means they probably heard me laugh a lot. 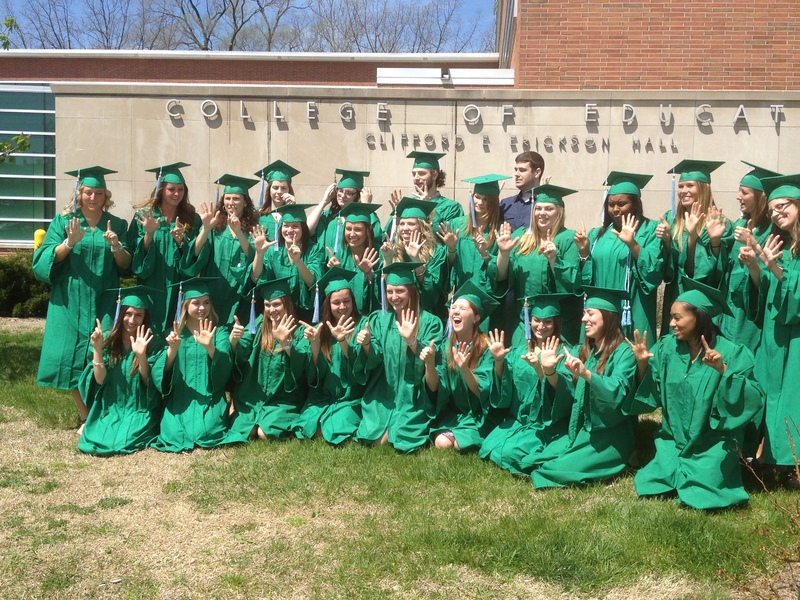 They dressed in their graduation gowns and we took pictures at Erickson Hall. It was the last class I will ever teach at MSU. Yes, Section 6 has been very lucky for me. 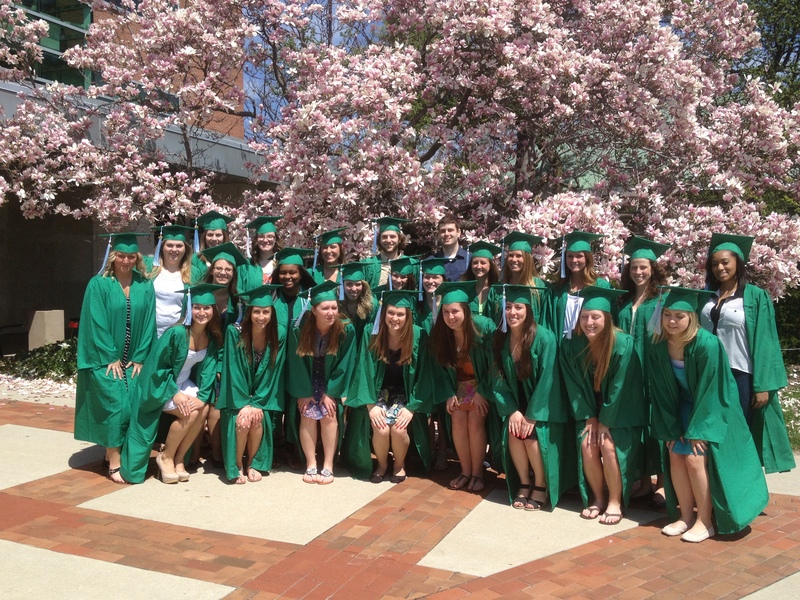 On Sunday, I am actually going to hand them their diplomas on stage at the Breslin. Two of my students are giving the commencement speech based on a poetry-writing assignment I gave them this semester. Another one is being honored for the highest GPA in the special education program. The chair of the TE department is letting doctoral students attend as “faculty” to honor the seniors they’ve worked with all year. I absolutely wouldn’t miss it.